Savannah State University (SSU) will celebrate Homecoming Week from Sunday, October 1, to Sunday, October 8. The week will be marked by multiple events, including music, lectures, networking events, a carnival, alumni gatherings and more. The celebratory theme is “Classic” in honor of Savannah State’s status as the oldest institute of higher education in Savannah and oldest public HBCU in Georgia. Yo Gotti will perform at the fashion show competition on Wednesday, October 4, 8 p.m., Tiger Arena. Tickets are $20. SSU’s Naval Reserve Officer Training Corps (NROTC) will host three events, open to the public, on Thursday, October 5. A leadership panel will begin at 1 p.m., followed by a mentoring session at 2:30 p.m., in King-Frazier Student Center. A reunion banquet will be held in the Student Union, 6 – 10 p.m. Banquet tickets are $50, available by calling 912-358-3089. Tee off with the annual homecoming golf classic on Friday, October 6, 7:30 a.m. at Crosswinds Golf Course. Sign-up as an individual player or a get a group together and become a sponsor. Proceeds benefit the scholarship fund. A campus parade, carnival and fish fry will be held in Alexis Circle at noon on Friday, October 6. The event connects faculty, staff, students and alumni. The annual pep rally will be held Friday, October 6, 8 p.m., Tiger Arena. Tickets are $25. The Homecoming Parade will be on Saturday, October 7, at 9 a.m. in downtown Savannah. 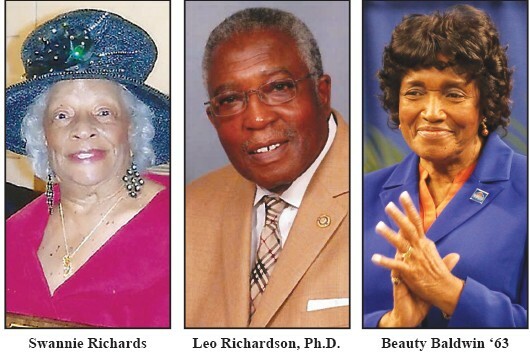 The grand marshals are Leo Richardson, Ph.D., and Swannie Richards. The honorary marshal is alumna Beauty Baldwin ‘63. The parade will be followed by the football game at 2 p.m. against Hampton University. Tickets are $15-$35. The popular Greek step show will be held Saturday, October 7, 8 p.m. in Tiger Arena and showcases the impressiveness of Savannah State’s Greek organizations. Tickets are $20. All events and details are listed at www.savannahstate.edu/homecoming.